Welcome to Kymm's Website...where wellness is a destination. Time stands still so that you can escape to a place where relaxation is a reality. Kymm's provides a nurturing environment, combined with caring and experienced hands. Restore yourself to a gentle time where your needs are a priority. Owner, Kymm Orlando, brings 40 years of experience in the Spa and Wellness Industry to the San Diego area. 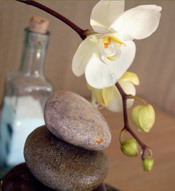 She integrates a variety of services and modalities to promote balance in body, mind and spirit. She offers mobile services that will transform your location into a holistic retreat. You can click on the "Kymm's Services" page to learn more about the various techniques she uses in her work. If you'd like to request an appointment please click on the "Request a Session" page. Kymm will personally call you back to confirm the details of your appointment, and answer any questions you might have.